Legitimate charity? How do you know? In this new year, are you giving to a new charity? How do you know it's legitimate and where the money is really going? PHOENIX — In this new year, are you giving to a new charity? How do you know it's legitimate and where the money is really going? Last year, we checked out Disabled Veterans of Arizona . It may sound like a charity, but it was not. Owner David Kaplan made it clear, it was a Scottsdale business. It's a vet-friendly listing website. And Kaplan said some of the money paid to list would go to support veterans. In it's first six weeks, we found just $800 went to vets and all of it to the Disabled American Veterans or DAV. 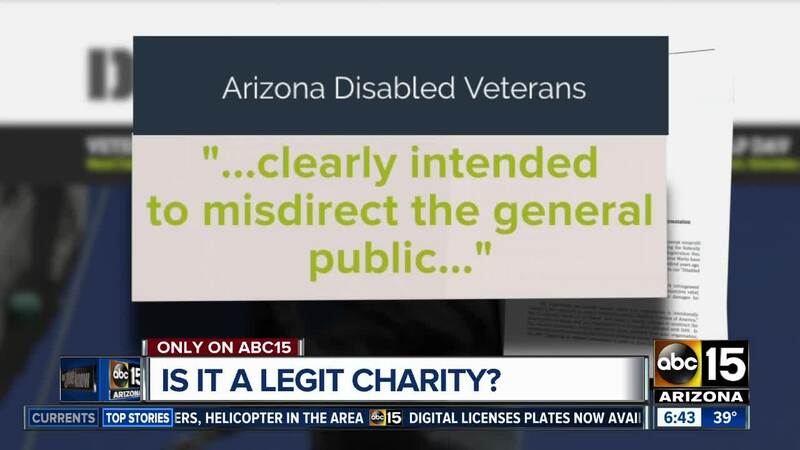 We also found the DAV told Disabled Veterans of Arizona to stop using that name since it was too close to their own. Since our story aired in November, Kaplan did stop using that name. His business is now called veteranbizdirectory. Kaplan said he heard there could be possible name confusion. And he says that was never his intent. Also, the DAV says they gave back all of the money given to them by Kaplan's business. They say they will not accept any more. To check out a charity, start at the IRS website . Run a "tax-exempt organization" search. The name should appear there. It also should show if an organization has been removed. You also want to check the charity's 990 tax form. It shows how much of your donation actually goes to the cause. You can do that through Guidestar , Charitynavigator , Charitywatchdog and the BBB's Wise Giving sites.